For many, sixpence coins are more well known as a part of cultural lore than as a once-important part of the British pre-decimal monetary system, as well as that of several other nations, including Colonial America. So, for being a being a somewhat diminutive 19 millimeters, about the size of a United States one-cent coin, sixpence coins certainly have an incredible large presence in history. 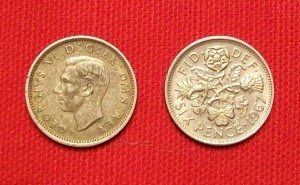 During most of their production, sixpence coins were struck with a 92.5 percent silver composition, which in 1921 was reduced to 50 percent. In 1947, silver was removed completely from the coin, and was struck with a cupro-nickel composition until its last year of production in 1970. Prior to decimalization of the British monetary system in 1971, a sixpence coin was a worth 1/40th of a pound sterling, though was devalued to the equivalent of 2-1/2 new pence until June 30, 1980. Vintage 16th Century Money – Sixpence coins were first struck during the reign of Edward VI in 1551 and have depicted the various kings and queens of the British Isles over the decades. As the throne has changed hands, so, too, have the faces depicted on the obverses of sixpence coins. And a Sixpence Coin in Her Shoe – Perhaps one of the most popular references to sixpence coins comes in the form of a popular rhyme that goes something like this: “Something old, something new, something borrowed, something blue, and a sixpence for her shoe.” While the rhyme derives from sometime during the Victorian era, its origin dates back to the 1600s, when the Lord of the Manor would present brides with silver coins, and often they would be sixpence coins. Putting a sixpence coin in a bride’s shoe is intended as a symbol of her future financial security and wealth. Some Scottish grooms observe a similar tradition in which they place as six pence coin under their shoes for good luck. For this reason, a sixpence coin is often viewed as something of a novelty and makes a great gift, especially for a bride or groom. Sixpence Coins as Good Luck Charms beyond the Altar – Beyond their importance to brides on their wedding days, sixpence coins are viewed as good luck charms by many others, including Royal Air Force crew people, who have been sewn behind their brevets or wings. 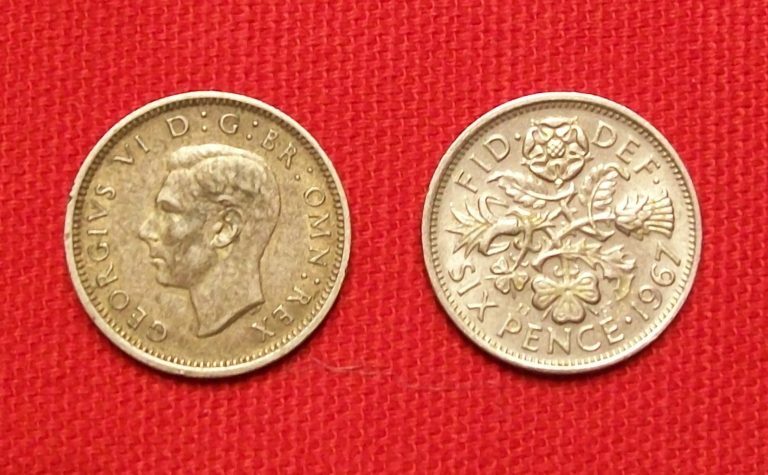 What’s the Record Auction Price for a Sixpence Coin? – Before the United States began striking federal coinage in 1792, each of the colonies had their own coins, including Massachusetts, which struck sixpence coins during the 17th century; many of these coins are now highly rare. In fact, a 1652 Massachusetts sixpence coin, one of just eight known to exist, commanded a hefty $430,000 at an auction in November 2012.